Yoga on the Go with Happy-Go-Yoga! I’ll admit it: I hate going to the gym. When my life gets busy, the first thing I cut out from my calendar is gym time. I know I need to workout more; I just hate actually doing it. I’d much rather spend time hiking or snowboarding instead of running on a treadmill. 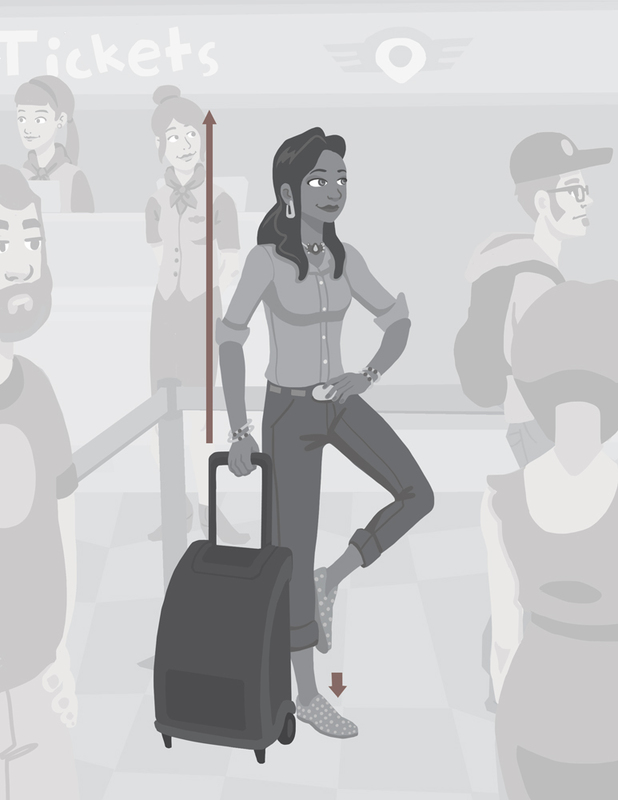 When traveling, I’d much rather leave the gym clothes at home and instead use that precious luggage space for something else (anything else, actually). Not too long ago, I was in New York City and met my friend, Christine Chen, for lunch. I met Christine when I was in college and she was then a news anchor in Seattle. Not too long after I moved to Austin, Christine became a yoga instructor. After she moved to New York City, she was busy teaching yoga all around the city (and the world). Then she told me about her new project: Happy-Go-Yoga, her witty take on traditional yoga, designed for people who don’t have time for—or simply don’t do—yoga. I couldn’t wait to learn more as I’m always looking for new and interesting ways to get more exercise into my life. I asked if there would be any poses for frequent travelers, and Christine, because she travels so much too, had a bunch of them for me that she does on the plane and everywhere between points A and B. A few weeks ago, a package from New York arrived – inside was a preview copy of Christine’s book. Luckily I had a few upcoming trips, and I tucked HGY into my backpack. A couple days later, I was settled into my coach seat (no upgrade because I was on an award ticket), and I pulled out HGY. 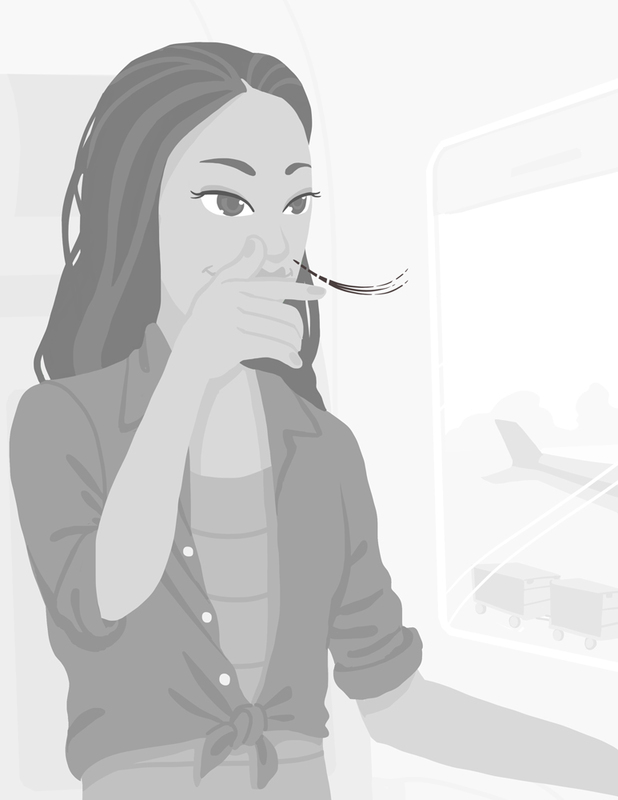 I flipped to Chapter 1: Travel Buddies – Relief for your back, body, and mind during long flights and challenging commutes. I quickly read up on “Eagle Perch,” a pose to help alleviate tight shoulders, stretches the upper back, and supports blood flow to help prevent muscle cramps and stiffness. I may have looked a little odd to my fellow seatmates, but man, did I feel good! Upon landing, I practiced the “Smooth Landing.” This is a simple breathing exercise, which was adaptation of a particular breathing technique used to create a balance between the dueling parts of the nervous system. Just as suggested in HGY, “Smooth Landing” helped relax my mind after a bumpy flight. I wasn’t done! Outside the airport, I was waiting for my über car, and I found myself “Grounded in a Good Way.” This pose is a take on the classic Tree Pose, which helps tone leg muscles and relieves stiffness in legs and hips. After a few seconds, I felt the tension in my legs melt away. Back hurt from standing in line for so long? There’s a pose for that. Frustrated with your coworker? There’s a pose for that. Hoping you can improve the communication in your relationship? There’s a pose for that too. Happy-Go-Yoga is available in stores and online beginning today, March 10, 2015! Follow this link to find Happy-Go-Yoga near you! I just bought a copy in Apple iBooks so that I can always carry a copy on my iPad. If you plan on buying your copy of HGY from amazon.com, I’d like to remind you that you can help support primate conservation and research by starting your shopping trip at the homepage of the American Society of Primatologists. 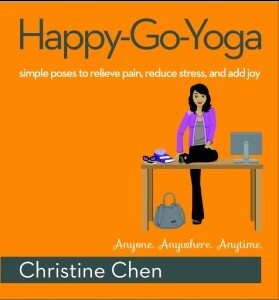 To help celebrate the launch, I am giving away a copy of Happy-Go-Yoga: Simple poses to relive pain, reduce stress, and add joy. All you have to do to enter is comment below about how you stay healthy while on the road… a tip that everyone can use anytime, anywhere. Christine will chose a winner and share it via Facebook, Twitter, and Instagram! Contest Details: That’s it. Contest ends 9:00 p.m. CDT on Tuesday, March 24, 2015. All decisions are final, void where prohibited, I make all the decisions regarding the giveaway, and there is no appeal **yadda yadda yadda** The winner will be announced by March 30, 2015. Good luck! I try to stay healthy on or off the road by exercising portion control. That’s basically the only type of exercise I’ll commit to… This works out great on trips because that means I have room in my belly to try out more dishes and/or restaurants rather than stuffing myself silly at one place or with one dish. yoga is good stuff, especially after a hard day skiing or a long car or plane ride! I always bring healthy snacks with me on the plane and keep away from the junk food that gets pushed onboard, in lounges and clubs. This way I can control my options! I try to stay healthy on the road mostly by getting enough sleep – rest and relaxation, for me, are the key – and, of course, eating healthy foods when dining out.